In 1966,a small town in West Virginia became home to the Mothman legend - one of modern mythology's most powerful and mysteries stories. Who or what this creature is or was can only be guessed, but proof of its existence is beyond any reasonable doubt. Situated on the Ohio River, Point Pleasant, West Virginia is a small town with a population of only about 5,000 people. Everyone knew each other well and back in the 1960's residents of such a small, rural community did the best they could not to draw too much attention to themselves. So when Roger Scarberry's car came screeching to a halt in front of the Mason County courthouse on November 15, 1966 Deputy Millard Halstead knew that something very real had just taken place. Roger Scarberry had just been driving down a road past the McClintic Wildlife Management Area, a nature preserve about seven miles from Point Pleasant, when one of the passengers in his car spotted something unusual. Scarberry and his passengers - his wife Linda Scarberry, friends Steve and Mary Mallette, and their cousin, Lonnie Button - were familiar with the area, as were many of the young people from the nearby towns. The McClintic Wildlife Management Area had housed the West Virginia Ordnance Works, a hidden TNT factory from World War II. The "TNT area" as it was called by the locals, had been long since abandoned as a military operation. Its distance from town and low-profile made the area a popular hangout for local youths, who could get away from the prying eyes of their small-town neighbors. Scarberry and his passengers stopped the car in front of the factory gate. Like the other youths in town, they hung out regularly in the area and noticed that something was unusual. A pair of glowing red lights had appeared near the gate. As they looked upon them, the lights moved toward them, and they realized that these were not lights at all, but a pair of glowing red eyes attached to a dark figure. The creature stood nearly 7 feet tall with huge wings folded behind its back. Without hesitation, Scarberry hit the gas and fled the area as fast as he could. According to everyone in the car, the creature immediately took flight and followed the car down the road, keeping up with ease. Even as Scarberry pushed the car past 100 miles per hour, the glowing red eyes stayed just behind them. Finally, Scarberry reached the Mason County courthouse and the creature flew off into the darkness. This was the first, but not by any means the last sighting of the creature that would become known as "The Mothman". One would think that five young locals who came running into a courthouse hollering about a "flying man" would bring nothing but immediate doubt, but to his credit, Deputy Millard Halstead could tell that this was no hoax. "I've known these kids all their lives. They'd never been in any trouble and they were really scared that night. I took them seriously." he would later say. Even in separate rooms, every witness told the exact same story, and the terror in their eyes told the Deputy that something had definitely happened to these kids. Halstead took them so seriously that he followed Scarberry back to the TNT area to look for the creature. They found nothing there, but it wouldn't be long before the Mothman legend continued. 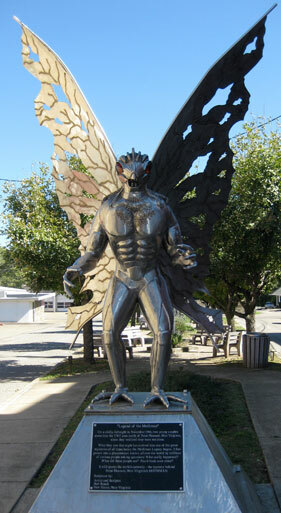 It didn't take long for word of the Mothman to spread. The very next night, on November 16th, 1966, frightened townspeople took up arms and combed the TNT area for the creature. They wouldn't find it, but at a nearby home someone who wasn't looking for the Mothman would.